If you’re a first-time fundraiser or simply in need of some fresh inspiration, here are our ultimate step-by-step guides on how to organise your very own wear it pink event at work, at school or in your community. 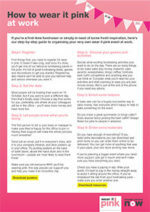 You can download, print and use these throughout your wear it pink planning. If you still need a little bit of help with your fundraising, just call us on 0333 20 70 300 or email us at wearitpink@breastcancernow.org – we love hearing from you! A handy how to guide that will provide inspiration and information on how to wear it pink and fundraise in your community. Use this useful step-by-step guide to ensure that your wear it pink event rules the school. 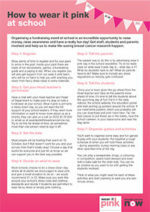 Download this useful guide for advice and inspiration that will help you plan a wear it pink event that the whole team will love.